In PyeongChang, SWA’s master planners took their cues from the landscape itself. Pedestrians will flow along a continuous promenade between these venues for the first time, saving hours of shuttle bus time while also being immersed in the ultimate sports experience. Locating all events in one valley created the most efficient, exciting experience for both athletes and visitors to the Games, and disturbed as little of the region’s steep terrain and pristine pine forests as possible. SWA Group’s master plan for the three Nordic Events venues in PyeongChang, Korea—the Ski Jumping, Cross Country Skiing, and Biathlon stadia and courses—honors the natural beauty of a spectacular Olympic Winter Games landscape as never before. The Nordic Events venues were originally slated to be located in separate valleys, requiring athletes and spectators to travel from site to site. 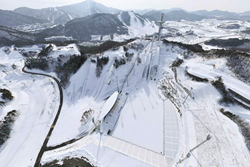 But in PyeongChang, SWA’s master planners departed from that logic and instead took their cues from the landscape itself, resulting in this optimal configuration—the most compact design in Olympic Winter Games history. Locating all events in one valley achieved two goals: creating the most efficient, exciting experience for both athletes and visitors to the Games, and disturbing as little as possible of the region’s steep terrain and pristine pine forests. In PyeongChang, pedestrians will flow along a continuous promenade between these venues for the first time, saving hours of shuttle bus time while also being immersed in a sports experience. The arrival sequence to the Ski Jumping Stadium is choreographed to build viewer excitement. Visitors arrive at a plaza flanked by three practice jumps, the monorail that transports athletes, coaches and officials to the tower and Large Hill and Normal Hill in-runs, and the Ski Jumping Stadium itself. Everywhere visitors look is a visual cue of the sports drama that awaits them. 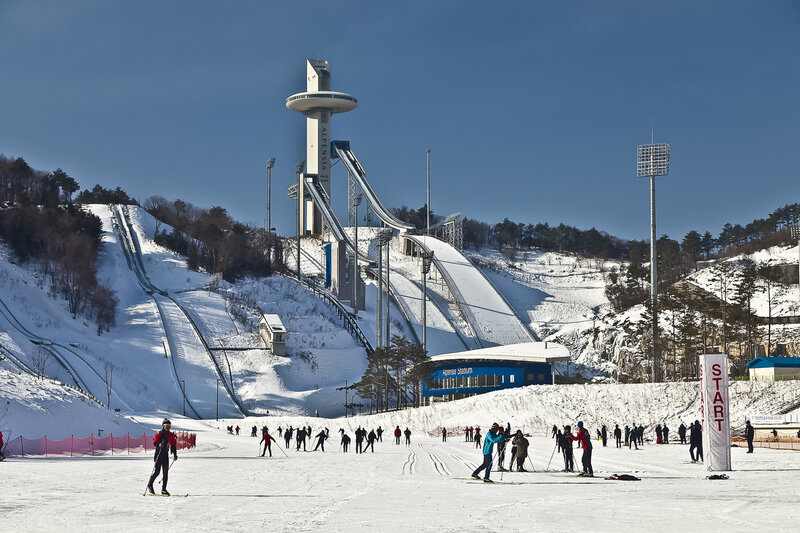 Created for Korea’s 2014 Olympic Winter Games bid, these compact Nordic Events venues have already performed well, hosting competitions such as the 2011 FIS Ski Jumping Continental Cup and 2013 FIS Far East National Championships. Summers also bring an active site, with an 18-hole golf course, rollerblade training, and soccer pitch replacing the snow sports. SWA Group, an international landscape architecture, planning and urban design firm, celebrates its 61st year creating healthy, vital outdoor spaces around the world. SWA was the master planner for the Nordic Events venues as part of Taeyoung Engineering & Construction's design-build consortium. Space Group architects designed the stadia.